where you get the hood scoop? Here is a picture of my HPI 68 Camaro body . ^ Or make one yourself from foam or styrene.. Not hard but one needs to have good hands and experience. Nice Camaros up there brothers. 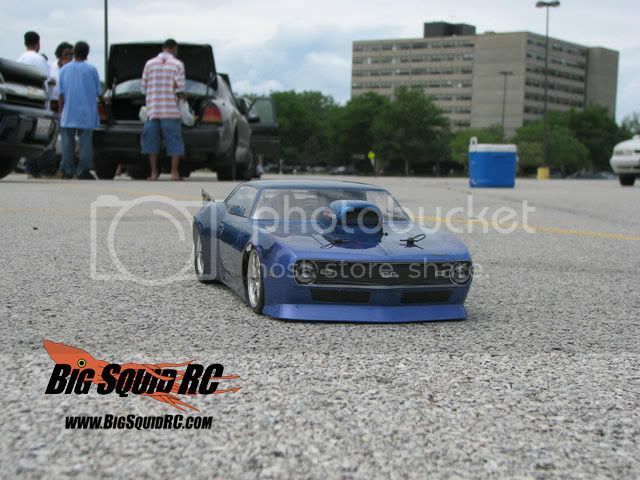 I'm building a 1/8 1985 Iroc with a 4-stroke, not a drag car but a stock scaler. Good luck with your build amigo. Are you talking about my car? Yeh MAGGIO let me know some info about your car also. I would also like some info on MODRODZ's car also. Team Walbern Pro Mod Chassis. Mamba Maxx 7700KV with 10 cell NiMh. Do you have pictures of the blue camaro from the side & is that a nitro or electric. What tires are on the back of the car? Here's my shot at racing a doorslammer. The ahr43 R3E. Early 2008. HPI Camaro. Love the body. I mounted it to a modified GMS DragSpec. 10x2 Trinity brush motor. LiMn 2s1p x 3800. Ran best of 2.272sec at 55.8mph. Because body is a 200mm it kinda wanted to 'kite' at times. Eventually settled it down with an XL rear spoiler. Good body to race with though. TIP: Don't use the trim line at the front. Let the front lower body extend as molded back to the front wheels. That'll help keep the air from getting under it and wanting to lift it. Hope this helps. Have fun. Post up some images. Like I say, love that body.